Sleeps four. NEW cushions. Mounted port-a-pot. Smart VHF and antenna, integrated for GARMIN GPS. Weather proof stereo with AUX ans USB. NEW lights and wiring. 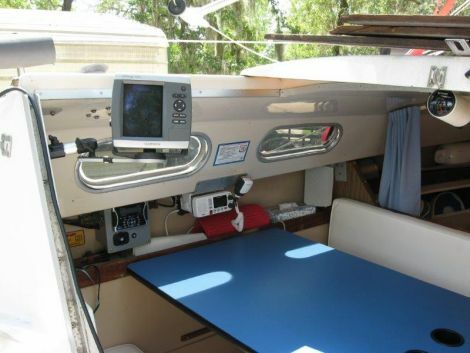 Two over-sized batteries w/ marine maintenance charger (dual)and battery A-B switch. Rebuilt 5200 lb capacity trailer with hydraulic surge disc brakes. Redesigned for long hauls. Too much good stuff to list. 352-637-6170 / 352-476-5699. Please leave message if no answer.